Luoyang - So many dynasties have risen and fallen in China over the centuries that several different cities could claim the status of capital at one time or another. There are said to be four great ancient capitals of China. Of the four, Luoyang is the oldest. 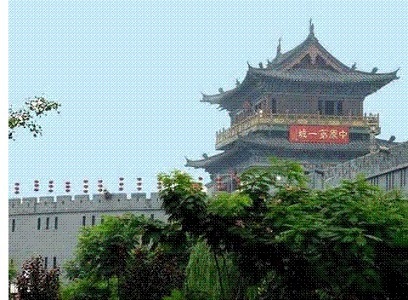 In fact, it is considered one of the cradles of Chinese civilization. And over the course of China's history, Luoyang has been the capital longer than any other city. Its name comes from its location. The north side (yang) of the Luohe River. It is situated in the western end of the Henan Province in Central China. The capital of the Xia Dynasty was somewhere in the vicinity, but since no archaeological evidence has been found from that era, it is not certain that it was Luoyang. But it is certain that it was the capital of the Zhou Dynasty, becoming so in 771 B.C..
After losing its position as capital under successive dynasties, it regained that role in 25 A.D. during the Eastern Han Dynasty. After the fall of the Han, it fell from its position once again, but returned to prominence and enjoyed its greatest ascendancy during the Sui and Tang Dynasties when it was one of the largest and most prosperous cities on earth. Historically, Luoyang has also been a very important religious center. Though information on his life is sketchy, tradition holds that Lao-tzu was from Luoyang and it was here that Taoism originated. And when Buddhism came to China from India, it came to Luoyang. Emperor Ming of the Eastern Han built the White Horse Temple in 68 A.D., so named because when he sent a delegation west to learn more about the religion, it returned with two monks, bringing Buddhist scriptures, statues and relics on the back of a white horse.